Otolaryngology Update: 3rd NATIONAL FACIAL PLASTIC SURGERY COURSE ,1st , 2nd and 3rd September 2015, M.S.Ramaiah Advanced Learning Centre, Bangalore. 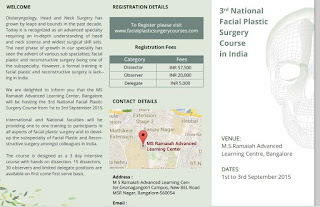 3rd NATIONAL FACIAL PLASTIC SURGERY COURSE ,1st , 2nd and 3rd September 2015, M.S.Ramaiah Advanced Learning Centre, Bangalore. 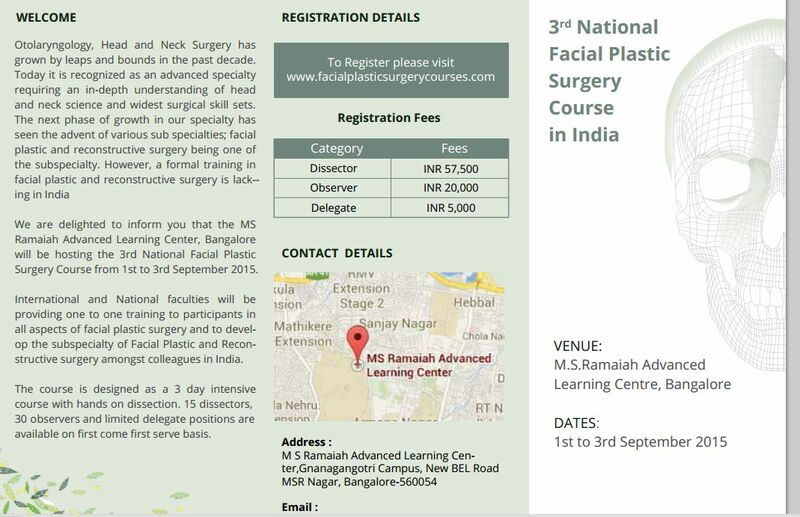 It gives us great pleasure to invite you all for, the 3rd National Facial Plastic Surgery Course from the 1st to the 3rd September 2015 at M.S.Ramaiah Advanced Learning Centre, Bangalore. There have been many advances in the field of Otolaryngology, Head and Neck Surgery in the recent past.This course will be an excellent opportunity to hone your facial cosmetic surgery skills. We fondly recollect your overwhelming response to our last course and it has encouraged us to try harder to give you a better experience this time around. We have confirmation from some of the top facial plastic surgeons in our field who have committed to be with us for the course. Mark your dates and book your seats, as here are limited seats available on a first come first serve basis !